Whenever we board a plane, the tension rises. Every single adult on the plane cranes their neck to watch us board, hoping against hope that they’ll be paired with the 350-pound linebacker who overdosed on Axe body spray rather than our two ticking time bombs—a pair of little girls. I can’t exactly blame them. I’ve had my share of awful kid-related flight encounters—including one poor little girl whose mom apparently failed to pack a single toy for her, so she kicked my seat and got yelled at throughout the four hour flight. But that’s the trick—keeping your kids entertained so they don’t scream bloody murder, kick your neighbor’s seat back, or drive you crazy. Fortunately, after subjecting our kids to several transcontinental flights, we’ve mastered the art of making flying the not-so-friendly skies much easier on us—and those who sit near us. 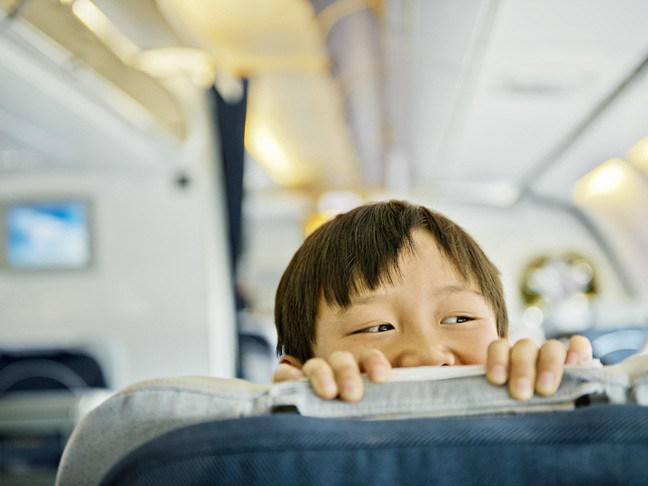 Here are my top thirteen tips to keep kids entertained on an international flight. Choose seats wisely. Stick close to the bathrooms if you have a newly potty-trained kiddo, to make that last-minute dash for the bathroom a bit easier. For babies or rambunctious toddlers, a bulkhead seat that enables you to use the airline’s bassinet or gives you a little extra legroom for your baby to wander will be a godsend. Let them know what to expect—and how you expect them to behave. If your kids know going into it that their ears might feel funny on the takeoff and landing, and that they will need to avoid kicking the seat in front of them, you’ll go into the flight with some ground rules already set. Relax the rules. Sure, you’re all organic snacks, wooden toys, and no screens when you’re on the ground, but if there’s ever a time to bend the rules, it’s a twelve hour flight. So go ahead and let them binge watch Calliou over a pack of Goldfish crackers. They’ll have on headphones, so you won’t even have to hear Calliou’s awful, whiny voice. Make it easy for them to sleep. Look for ways to encourage sleep (that don’t involve Benadryl). Choose a flight time that coincides with nap time or bedtime, and use that pre-flight time to take a long stroll through the airport to help get out any excess energy. Don’t forget to pack a favorite blanket and buddy to make it easier to catch a few zzzs. Surprise them. Consider wrapping up a few special new (small) gifts that they can enjoy on the flight. Give them out liberally when the restlessness starts. Unwrapping the gift is good for a few minutes of entertainment—and then they have that new travel game or set of stickers to enjoy. Stock the right stuff. At a bare minimum, bring some sort of tablet with kid-friendly games and videos, several easy-to-eat snacks (nothing that could lead to stains or stickiness), paper and crayons, a small toy or two, and several sheets of stickers. You don’t even have to get all spendy: A month or so before your trip, purge a few easy-to-travel toys from their toy box, and reintroduce them on the flight. Get them excited about the destination. A flight can be a great lesson in geography and culture. Pack a travel book or two—photo-heavy ones for little kids, dense guides for the older ones—and let them loose with a pack of sticky notes to mark the things they’d like to see. If people at your destination speak another language, designate your child as your new interpreter, and let them study a phrase book or work with a translator app to find out how to say “My favorite color is yellow” in Portuguese. And include a map so you can have kids follow the route you’re flying to help answer any “Are we there yet?” questions. Get crafty. Yeah, you’re not breaking out the glitter and finger paints on a five hour flight, but kiddos can still get their craft on. Look for beginner kits for origami, weaving, or knitting, or even something like cross stitch. Bring a sippy cup and at least one change of clothes for everyone. We learned this one the hard way, after my husband had to spend several hours in soda-soaked pants after an in-flight mishap. You’ll want a covered cup for any spill-prone kids, and an extra change of clothes for everyone, just in case luggage gets lost or a spill or other accident happens. Don’t be above bribery—of your kids or your seatmates. 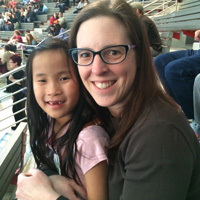 Dangle something enticing (a cool day trip, a promise of an ice cream outing) for your kids. And if that doesn’t work, several parents have opted for splurging on candy, cocktails, or another goodie for their seatmates to apologize for less than stellar behavior. Don’t sweat it. Yeah, you’re probably going to get dirty looks when your kiddo starts crying (and it’s inevitable—someone’s going to cry during the flight). But that’s only natural, and as long as you’re making a reasonable effort to keep your kiddo entertained and quiet, you’re rocking this travel thing.